I know that not all of you are interested in the ABC’s of Love series, so I’ll be including a few other posts for you too. Recipes, crafties and the like. I saw this in a magazine… unfortunately, I don’t remember which one. I’m thinking it was Family Circle, but I’m not positive. This project is cheap, fast and easy. My three most favorite things in combination, as far as crafts go anyway… I bought all the supplies at the Dollar Tree for $2. Each ring maybe cost me five pennies. And I spent about 10 minutes on this, and five of those were waiting for the glue gun to heat up! 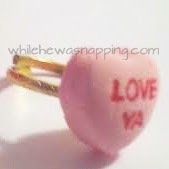 1) You will need some candy conversation hearts and some rings. Mine are gold (because I couldn’t find silver) and were back in the “wedding” section at the Dollar Tree. 2) It’s as simple as it looks. Using a hot glue gun, glue one heart on each ring. Disclaimer: These are NOT edible! And it is only hot glue, so they aren’t all that sturdy. Be careful (and maybe keep the glue gun handy for repairs…). For longer-lasting results, use a stronger glue (LocTite is my preferred poison) and I would spray the candies with a clear sealer to help prevent chipping or breaking. Even then, they won’t last forever. That’s it. Easiest tutorial I’ve ever written. Probably easiest project I’ve ever done. Cute though, right? What little princess wouldn’t love one of these? I know it’s been said before, but SO CUTE!! Actually, I think that’s one of the conversations on a heart hehe. I love this idea. These are fun little rings! Perfect for a kids Vday class party! Really, really CUTE CUTE CUTE!!! Okay, how cute are these???!!! My daughter would flip for these! I can see my girls putting one of these on each finger. I love a craft that is quick and simple – thanks for sharing. Way too cute! I think this is what I will be making for my bible study ladies. What a great idea for short-term jewelry! I am featuring this at somedaycrafts.blogspot.com. Grab my “featured” butotn. Love this idea! Definitely going to try it, thanks!